Leapers are descendants of Khybors. During the struggle to create a homeworld for Khybors, free from the persecution and attempted genocide by groups such as the Set'ri, many uses were found for khrystal, bio-crystal that merged with their genetic structure. Khybors could heal, can adapt their bodies to environments that would kill ordinary Humans, and other talents. Among those talents: the ability to merge their minds with machines -- eventually with starships -- and find the gaps in the fabric of space and time, to slip through the weave of reality into alternate universes. Pilots who could pull their ships along with them were first known as Skip pilots, and then Leapers. When the most deadly wave of persecution began, the Khybors were able to evacuate their homeworld of Norbra and not only flee the galaxy, but the universe, and find safety. Many generations later, after the Downfall, as civilization rebuilt and reached out to the stars again, after the Central Allied Worlds had become the Commonwealth, the Leapers returned. Novels about the transition from Khybor to Leaper are being written right now: SLIPPING THE WEAVE and FIRST LAW. And many more are planned! Qinda was a nobody, surviving on her wits, and cursed with genetics that hinted at unusual gifts. Strong enough hints to make a powerful, domineering old woman chase her across the star systems to gain possession of her. When her safe home on an agricultural planet is threatened by her enemy, Qinda and her husband know the only way to keep them all alive and safe is to split up, and hope to reach the Commonwealth where they can request sanctuary. But along the way, someone even more powerful finds Qinda's trail, and he has the law on his side when he takes her prisoner. Adlan Caderi has been seeking the power to rule the universe and break the Leaper monopoly, and Qinda is the final element of his plan, the last piece of the puzzle -- or so he hopes. He had her bred, and she is his property. But the only way he can win is to win her loyalty and her love, and implant in her the dream of power that has carried the Caderi clan for generations. 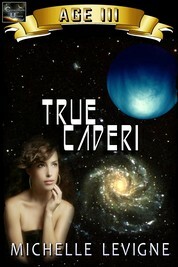 The struggle to make Qinda a "true Caderi" will endanger both their lives, and awaken her to the question: Is she willing to gain the universe, at the cost of her soul?